Yesterday Phil Wolff at Skype Journal brought our attention to an “infographic” (link removed due no access to Skype Journal) from the financial due diligence-minded Credit Score Blog for Focus.com. It attempts to provide a history of Skype both from the technology and financial performance perspectives. But, in addition to Phil’s Quibbles, I have found some others. Click on the graphic to see a larger image. Research and Design by Credit Score Blog for Focus.com (links removed due to irrelevance in 2013). Accounts and Users – there’s a difference! Starting with the IPO filing last year, Skype finally started to give out a more realistic number – the number of users who actually made at least one call or participated in at least one chat session in the previous calendar quarter. Whereas there were about 125 million in the April – June quarter of 2010, this number has risen to over 170 million for the January to March quarter 2011. In other words this is the number of active users. So while Skype had registered over 100 million accounts in 2006, they did not reach the level of 100 million users until late 2009 or early 2010. It’s those active users whom become interesting to Microsoft as they work with their Skype team to develop plans for Skype’s (and Microsoft’s) growth. Yes, Skype introduced video calling in early 2006; it first came of out beta with Skype for Windows 3.1 in early 2007 delivering 320 x 240 images @15frames-per-second . However, in November 2007, Skype showed it got serious about taking the lead in video calling with the introduction of High Quality Video which required a new line of Logitech webcams, new video codecs from On2 (since acquired by Google) and a new version of Skype for Windows (3.6) that could deliver VGA resolution (640 x 480) at 30 frames-per-second and over a 384 kbps upload speed Internet connection. With its superior quality that delivered in-your-face real time video, Skype video took off to the point where today video calling represents about 40 per cent of all Skype calls. In 2010, with the launch of Skype for Windows 4.2, Skype announced support for 720p HD video calling; at the time it only supported webcams from two vendors: the FREETALK Everyman HD and Facevsion N1 webcams. HD video was off to a rocky start; it required at least 1.2 Mbps upload speed on the Internet connection (above the upload speed of most broadband connections) and there were call reliability and stability issues. With a firmware upgrade in December (FREETALK, Facevsion) and the release of Skype 5.0 for Windows, HD video calling has become a much more reliable service. Recently Logitech released a line of webcams that support HD Video calling. Over the past few weeks I have received HD video calls from Logitech webcams where callers had only a 1 Mbps upload speed. Skype released High Quality Video in late 2007; they did not release HD Video until 2010. A major milestone for Skype video calls was the introduction of video calling on iPhones at the end of 2010. Finally, in early 2011, Skype took Group Video Calling out of beta, increased its capacity to ten participants and offered it as one component of its revenue generating Skype Premium service. Microsoft Anywhere Graphic – What Happened to Outlook and Office? The infographic attempts to illustrate all the potential Microsoft products that could benefit from embedding Skype technology and services. But what happened to Office and, especially, Outlook? 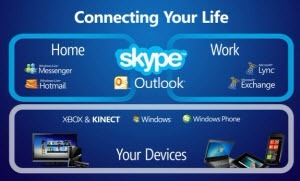 At the press conference there was, to say the least, a strong emphasis placed on how Skype could be integrated with Outlook for both consumer and business use. For Windows users, Outlook has become the core resource for managing users’ contacts; many products’ address books and scheduling features rely on the user’s Outlook Contacts and Calendars as the primary source of contact and calendar information. Outlook is critical for synchronizing a mobile phone address book, keeping the user’s schedule current and integrating Outlook information into third party collaboration services as well as many other Microsoft and third party offerings. Full disclosure: the author’s first association with Skype involved beta testing of the Skype Email Toolbar, an Outlook plugin that allows you to make Skype calls directly from Outlook. However, the Skype for Windows client now incorporates an optional feature for importing Outlook contacts into a user’s Skype contacts, so this plugin has become a secondary offering. I’ll place my bets on Outlook being the first or second Microsoft product to find Skype embedded into it. Internationalization: Google Voice really only works if you live in the U.S.; after all these years it still has no offerings for the rest of us around the world. Personally I have set up a Google Voice account during a recent visit to the U.S. but it’s of no use to me when at home in Canada. the SILK codec provides crystal clear voice on Skype-to-Skype calls, even when calling from/to iPhones and Android phones. Video: Skype is unique in providing 640 x 480 video calling @ 30 fps via a simple user interface. Since its introduction in late 2007, there has been no competitive service with such a large network of users that can deliver this quality of real time video calls. And now HD video capability is starting to penetrate the user base. Network connection: Skype has introduced features that monitor and adjust to the conditions of a call’s network connection such as to minimize the chance of call failure. Bottom Line: While the infographic is a good attempt at outlining both Skype’s financial background and user experiences, it is missing some key elements that have the potential to contribute significantly to Microsoft’s ability to benefit from a $8.5 billion acquisition. The key risk lies in how effectively Microsoft’s various product teams can work with the Skype teams to develop world changing communications-enhanced offerings. It’s a challenge to Microsoft’s ability to support real innovation. This represents the best opportunity for demonstrating Alec Saunders Voice 2.0 Manifesto where talk is the baseline, the meter is “off” and communications-enhanced applications are the value creators. PamFax: Who Uses Fax Today?